I have a Ford 600 tractor that the PTO coupler will not engage on the countershaft far enough. In December the tractor as split. A good used countershaft was installed that appeared to be identical to the old one which needed 4th gear and 2nd gear replaced. A new clutch and pressure plate was installed. A couple of the trans bearings were replaced. I do not remember which ones, now. Over the summer the tractor was finished. Then upon using it the PTO would not stay engaged. The PTO lever would jump out of engagement. I ordered a new PTO shaft and then a new PTO sleeve and the PTO would still not stay engaged. I removed the PTO side cover and the top of the PTO case under the seat. Everything works. However the countershaft is only sticking out of the oil seal sleeve (bushing) about 1/4 inch. There is not enough splined shaft for the PTO sleeve (pn717) to engage. I cannot remove the PTO support (770) as one of the bottom bolts is blocked by part of the casting for the hydraulic drain return or suction. Do you have any ideas before I split the tractor again? Thank you. Thank you Dollar Bill. Unfortunately, I get to redo it. Unfortunately, it sounds like the counter shaft was not assembled quite right and will need to be split again. Image may help verify proper assembly. The PTO stop is not bent and operates correctly. The collar is oriented correctly. The PTO shaft is new with new bearings. The problem seems to be that the countershaft oil seal sleeve77063 leaves only about 1/4 inch of countershaft 7111 exposed for the PTO collar to engage.. 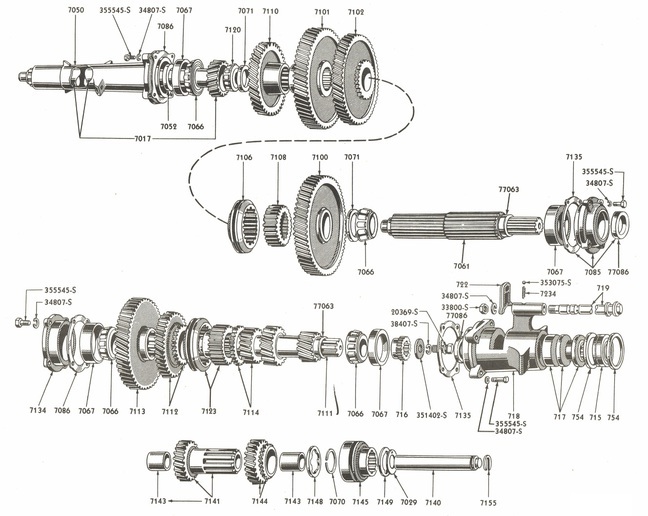 The countershaft needs to be 1/4 inch more out of transmission. Thank you Dollar Bill. Is it possible the sliding collar (717) was installed backwards? It will go one either way but will only engage the PTO when installed correctly. I've also seen the PTO stop (722) bend or the attaching nut loosen causing engagement problems. 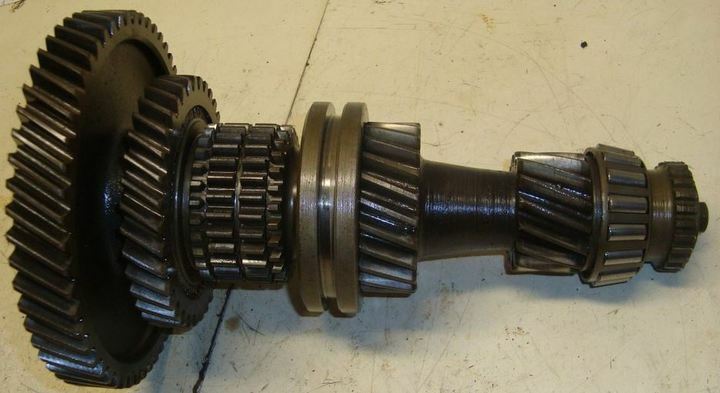 Any fore/aft play in the PTO shaft?